HTC adopts Android for new Flyer tablet and Facebook phones | What Hi-Fi? 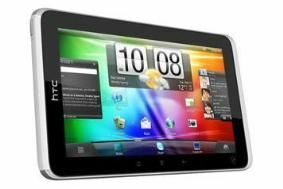 Latest out of the starting blocks is the HTC Flyer, a 7in tablet with an aluminium unibody construction, running Android 2.4 – it will be upgraded to Android 3.0 (Honeycomb) when that comes out. It has a powerful 1.5GHz processor, backed up with 1GB of RAM and 32GB solid state drive. A pair of cameras are on board too, one 5MP and the other 1.3MP. HTC has also redesigned the homescreen, with a carousel of apps, and the device comes with an active stylus. In Europe and the US the Flyer will come pre-loaded with various content including OnLive – the cloud-based gaming service – when it goes on sale in the second quarter of 2011. No news on pricing yet. As well as announcing the Flyer, HTC has also unveiled its pair of Facebook smartphones, bizarrely named Salsa and Cha Cha (yes, really). Each has an 'f' button that takes you straight to your Facebook homepage. No pricing confirmed, but like the Flyer they'll be available in Q2. Perhaps the most interesting thing coming out of MWC so far is the number of devices running Android. According to IMS Research, there will be an installed base of 140 million Android portable devices, including smartphones and tablets, by the end of 2011. Given that HTC was one of the big launch partners for Windows Phone 7, it's interesting to note that its new models all run Android.